Can You Gain 20 Pounds of Muscle in Three Months? Gaining 20 pounds of muscle in three months is possible, but takes meticulous planning and nutrition. In fact, strongman Jonathan Lawson was able to gain 20 pounds of muscle and lose body fat at the same time in only 10 weeks. Not only is it possible, but you can do it without the use of steroids or supplements. You'll be working hard in the strength room and eating a clean diet. Perform three full-body workouts per week, focusing on the compound mass movements for each muscle group. For example, train Monday, Wednesday and Friday. Use bench presses for the chest, lat pulldowns for the back, upright rows for the shoulders, decline close-grip bench presses for triceps, barbell curls for biceps and squats and deadlifts for the legs. Follow each compound movement with one or two sets of a contraction exercise for that muscle group. For example, after a heavy set or two of bench presses, do one or two sets of dumbbell flies. Use concentration curls for biceps, kickbacks for triceps, lateral raises for shoulders, under-grip lat pulldowns for back, leg extensions for quadriceps and leg curls for hamstrings. Complete nine to 12 repetitions on every exercise. According to Ironman magazine contributors Lawson and Steve Holman, this is the hypertrophy or muscle-growth rep range. 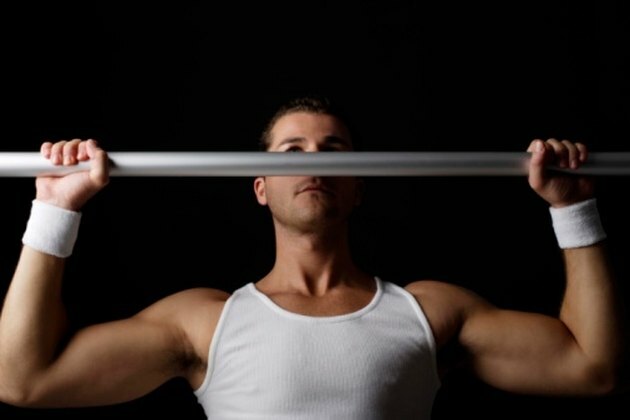 Lower and higher reps emphasize power and endurance muscle components respectively. The medium, nine to 12 rep range has been shown to induce muscle hypertrophy. Stop each exercise at the point of positive failure. This means continuing until you can no longer perform another controlled repetition. Train progressively by increasing the weight every time you reach the upper range, 12 reps, of the prescribed repetitions. For example, if you can complete 12 reps with 135 pounds on bench presses, increase the weight by 10 pounds for your next set. Progression is one of the pillars of strength-training,and forces the muscles to continuously adapt to new stresses by growing bigger and stronger. Drink a post-workout protein shake including 50 g of whey protein, 100 to 200 g of carbohydrates, such as fruit juice, and 30 g healthy fats, such as flax seed oil or medium-chain triglycerides. The "Muscle Nerd" Jeff Anderson recommends this ratio in his e-book "Optimum Anabolics." This shake delivers much-needed nutrients for muscle growth and recovery. Eat five to eight small meals throughout the day, with at least 20 to 30 g of protein at each. In addition, have a serving of low-glycemic carbs, such as oatmeal, brown rice, sweet potatoes, whole-grain bread or pasta or fresh fruit. Each meal should also contain a serving of healthy fats, such as flax seed oil, avocado, peanuts butter, olive oil, nuts and seeds or egg yolks. How Long Does it Take to Be a Bodybuilder?